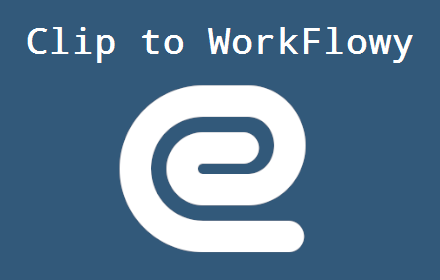 Clip To WorkFlowy just got a long overdue update. For awhile now, there actually have been two versions of the extension… the second one is called Clip To WorkFlowy GO. Well, all the “GO” goodness is being rolling into the original, and GO is being retired. It still works the same…. web page title in the bullet with the url tucked into the note. The extension will search your existing Chrome tabs and windows looking for WorkFlowy, and automatically go to the first one it finds. If there are none, it creates a new WorkFlowy tab and goes there. If you are using WorkFlowy’s Desktop app, well then we need to talk about all the reasons you shouldn’t… but I digress. If you are using the Desktop App this feature may annoy you, so you can turn it off in Options. There is also a new keyboard shortcut called “Toggle Last Tab”. This makes quick work of returning to the tab you just clipped. It also works throughout Chrome, so make sure you set the shortcut and remember it! To set the keyboard shortcuts Right Click the extension icon and select “Options”. Sorry it took so long, but now you can select text on the web page and it appears in your WorkFlowy note after the url. When you do, the url will be prepended with an ellipsis, giving a visual indicator there is more text to see. You can customize the “See: ” text to your liking, and toggle the “Disable tags” feature too. Also when, you clip inside WorkFlowy, you’ll see a “toast” banner message confirming your clip is ready for pasting. That’s it! Get it here. Happy clipping, Workflowians. 1. Zoom on a bullet. 2. Click on the sortWF bookmarklet or use the keyboard shortcut script. 3. Select a sort button and your list is automagically sorted. Only the zoom level children are sorted. Grandchildren stay with their parents, but are not sorted. Completed children are sorted, even when hidden. Short lists will sort instantly. Lists of 100s of children may take a few seconds. After sorting is complete, a banner message confirms the sort. Undo the sort using WorkFlowy’s undo icon or keyboard shortcut. For transparency, the bookmarklet will not sort if search is active. To limit the load on WorkFlowy’s servers, the maximum number of children that can be sorted is 400. Go here for the bookmarklet you can drag to your bookmarks bar. To use the keyboard shortcut Ctrl+Shft+S, you need a script manager like Tampermonkey, and then install this script. The TagIndex bookmarklet has been updated to version 2.0, and it’s the easiest and fastest TagIndex bookmarklet yet. Now, with just one click your index is created instantly in a new top bullet. Screenshot courtesy of Frank Degenaar. 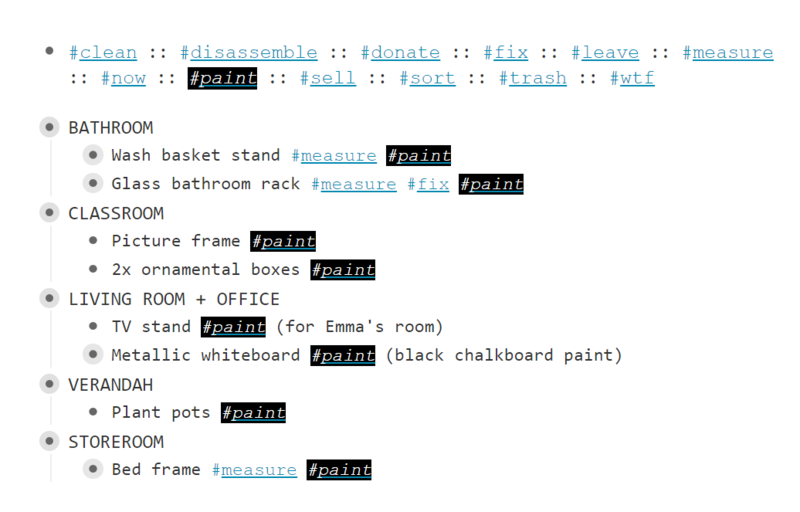 To create an index of all your WorkFlowy tags simply activate from your home page. Or zoom on a bullet, and the bookmarklet creates an index of all tags from the zoom parent’s children. The WorkFlowy to Google Calendar Chrome extension has been updated to support the new Google Calendar format. No date parsing, new events default to today, in the next half hour time slot. Default event duration is hard coded at 30 minutes. Selected text has been disabled. In the future, date parsing is possible, but it will require an extensive rewrite. If you have the extension installed it will update automatically. If not, head to the Chrome Web Store. If you are still clinging to Classic Google Calendar, install the WorkFlowy to Classic Google Calendar bookmarklet. Enjoy all that date parsing magic while it lasts. But I don’t like extensions! Likewise, if you don’t use Chrome or extensions, but are using the New Google Calendar, install this WorkFlowy to Google Calendar bookmarklet. Tag Index is by far my most popular bookmarklet, so I decided it could use a little love. What is the Tag Index bookmarklet? It simply creates a list of all your WorkFlowy tags from your entire outline, or confine things to just a bullet and its descendants. 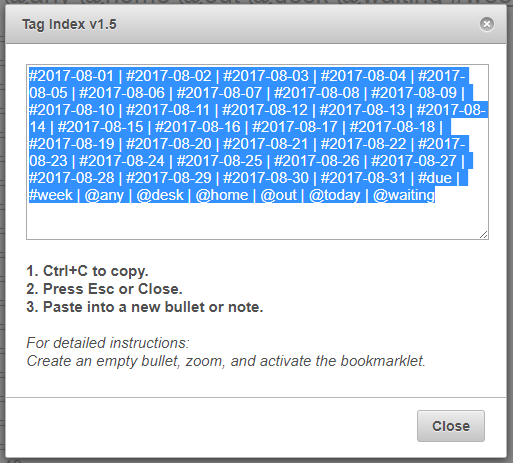 You paste the tag index into a bullet or note, giving you quick-clicking access to your tags via the index. Read about it in this WorkFlowy blog post. So now it’s: Activate. Copy. Close. Paste. My WorkFlowy to Google Calendar Chrome extension has updated to version 2.0 with some nice enhancements. 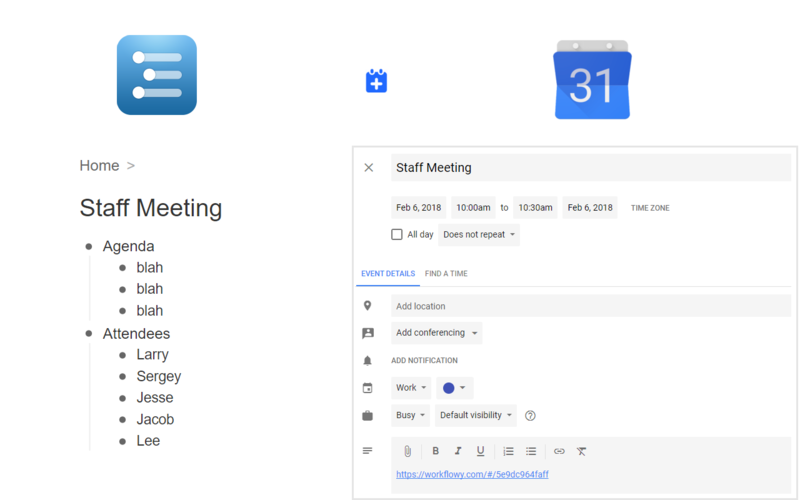 WorkFlowy to Google Calendar let’s you quickly create Google Calendar events from WorkFlowy bullets. Works on any webpage, not just WorkFlowy. Select event info on any webpage and utilize Google Calendar’s powerful Quick Add parser to intelligently add events, and reduce the time you spend typing. Scroll to the bottom of chrome://extensions to define your own keyboard shortcut. (I use Alt+G) If desired, you can hide the extension icon in the toolbar by right clicking the icon and selecting “Hide in Chrome Menu”, and be done with all that pesky icon clicking. See Keyboard Shortcuts for Google Chrome Extensions for more info. Update Sept 10, 2016: Now with right click menu access too! Add your event to any calendar on the first try! Previously WorkFlowy to Google Calendar was restricted to your default calendar. In order to change calendars you had to save the event first, and then edit it again. Now you can change the calendar without having to edit the event twice. The rest of WorkFlowy to Google Calendar’s goodness is still there. Google Calendar’s powerful Quick Add parser automatically defines the what, where, and when. Override the bullet or page title by selecting text on the page instead. WorkFlowy to Google Calendar will always automatically put a handy link back to your WorkFlowy bullet (or webpage) in the event note. A great way to create alarms for WorkFlowy items! Head over to the Chrome Web Store for more details and installation. If you’ve already installed the extension, it will update automatically. No Google Chrome? Get the bookmarklet version instead. Chrome 49: What’s Up With All These Icons In My Toolbar? Over the last few weeks, Google Chrome has rolled out Version 49, which contains a major change in the way extension icons are displayed in the upper right corner of your browser window. I was updated two weeks ago, and initially I hated it. I’ve changed my tune, because (without fanfare) they tucked in a long overdue feature. The result is, ironically enough, a much cleaner toolbar, if you prefer your extensions with keyboard shortcuts (and really you should) I’ll get to that in a bit. First some background. In one word: Visibility. Some applications will “side load” extensions without your knowledge. The Chrome developers also know many users don’t visit their chrome://extensions page very often (if at all), and are unaware of what is lurking, and potentially wasting resources. Initially, Chrome 49 moves all extension icons to the toolbar forcing you to deal with them. It’s pretty easy to show and hide them as you see fit. 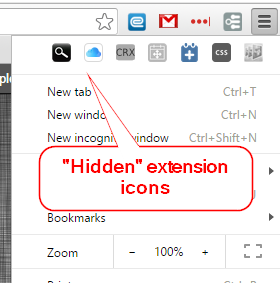 You can right click on an icon and select “Hide in Chrome menu”. Hidden icons aren’t all that hidden. They now appear at the top of the menu when you click the ⋮ hamburger icon. You can also drag an icon onto the ⋮ Hamburger icon and then drag it to the top of the menu… and vice versa. I’ve grown to like this setup. With a right click, you get quick access to extension options without the need to scroll through a list of extensions. Only enabled extensions appear in the menu however, so to access disabled extensions you’ll still need to type chrome://extensions into the addressbar, or click on More Tools > Extensions in the menu. Which extensions should I hide? The icons to the right of the Omnibar… the ones you are used to seeing. They are active on any web page you visit. You can assign keyboard shortcuts to them. Browser Actions get the long overdue feature. You can now assign keyboard shortcuts AND hide the icon. Before, when you hid a Browser Action icon, you disabled the keyboard shortcut. This never made any sense. If you are keyboard ninja and a toolbar minimalist, Chrome 49 will make you happy. Of course, you can still keep them visible AND have keyboard access too. Browser Actions may show status with an animated icon or badge, in which case you probably want to keep those visible. 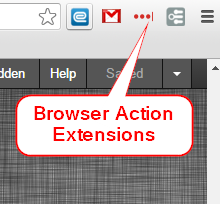 Pre-Chrome 49, these icons appeared in the Omnibar when certain rules, defined by the extension, were met. For example, they appeared only when visiting a certain domain, or if an RSS feed was available. 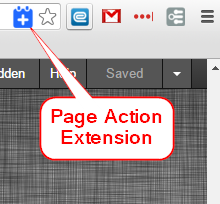 Chrome 49’s biggest effect is on Page Action icons, moving them to the right with Browser Action icons. This is a big step backwards, adding needless clutter to the toolbar, imho. The best choice for Page Action extensions? Show them. Pre-Chrome 49 these were only accessible by visiting chrome://extensions.